Show students the PPT slide and ask which type of eater they were. Ask if they still are and how their parents dealt with their eating habits. Ask if students felt their parents style was effective. Explain that they are going to learn more about the most effective way to get children to eat. 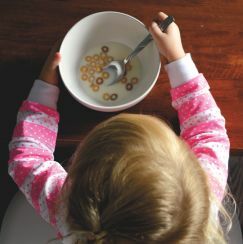 Cut apart the following articles by CNN “Of the four parental ‘feeding styles,’ only one is good for kids’ health, experts say” and Jill Castle’s “What’s Your Feeding Style?” by parenting style sections. Have students count off by 4’s and assign a parental feeding style to each group. Students are to read the sections of information and use to complete their notes for that style (see attachments). Students then create a presentation in Google Slides reflecting their notes. Re-assign students to new groups and spread them around the room. Randomly assign each group a parental feeding style. Groups must create a skit that includes all members and reflects the characteristics of their style and the audience must decide which style is being portrayed. I like to wait until all of the groups have shared before going over the correct answers. As a concluding assignment, students will research 5 different strategies that they could implement to help a child develop a healthy relationship with food. Students will then create a newsletter about the strategies using the CANVA App (Greenery template) that could be hung throughout the community to help educate parents. See guide sheet and rubric below for more details.